Santa Cruz Organic Fruit Spreads are great holiday entertaining staples and are a nice addition to holiday gift baskets for food-loving friends. The rich and flavorful spreads lend to a variety of culinary treats, both sweet and savory, and the crock-style jar is simple and elegant enough for a gourmet gift basket. When Santa Cruz decided to bring decades of organic fruit expertise to fruit spreads, they felt strongly that they must give you what you want. That’s why the first ingredient listed on every jar is exactly what you expect, ORGANIC FRUIT! Santa Cruz Organic® Fruit Spreads have a home-style spreadable texture that is unmatched. Look at the ingredients, then taste the results. · Personal pie—pies are the dessert darlings of 2011, taking the place of the beloved cupcake. Use Santa Cruz Organic Blackberry Pomegranate Fruit Spread as the filling and bake mini pies in mason jars for handheld party treat. · Sweet and savory chicken wings— use the raspberry fruit spreads as a base to make a glaze for a fresh take on chicken. · Festive Cheese Plate—adorn an elegant cheese plate with Apricot Fruit Spread, include spiced nuts, dried fruits and antipasti to offer unique flavor pairings. · Host/Hostess gift—Holiday parties can become a major undertaking. Thank the host with a breakfast basket for the next day by assembling pastries, a pound of coffee and a jar of Strawberry Fruit Spread. 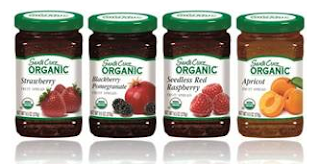 Buy It: You can purchase Santa Cruz Organic Fruit Spreads at your local retailer.